This paper looks at how notions of race are produced in ever-expanding US news coverage of health issues. Much coverage contributes to post-racial perspectives that render racial inequities invisible by constructing bodies, medical technologies, diagnoses, and forms of treatment as post-racial, creating the sense that no one should need to invoke racial to understand medicine. Nevertheless, a plethora of stories focus on genetics, programs that target particular ethno-racial populations, and seeming failures of racialized minorities to understand biomedical content as requiring discourses of race. Such racialized coverage performatively creates understandings of race, in interaction with gender and class, and then simultaneously naturalizes them and portrays them as notions whose invocation is problematic—often in the same story. Since 2014, there has been a significant increase in news coverage about the opioid epidemic in the United States. 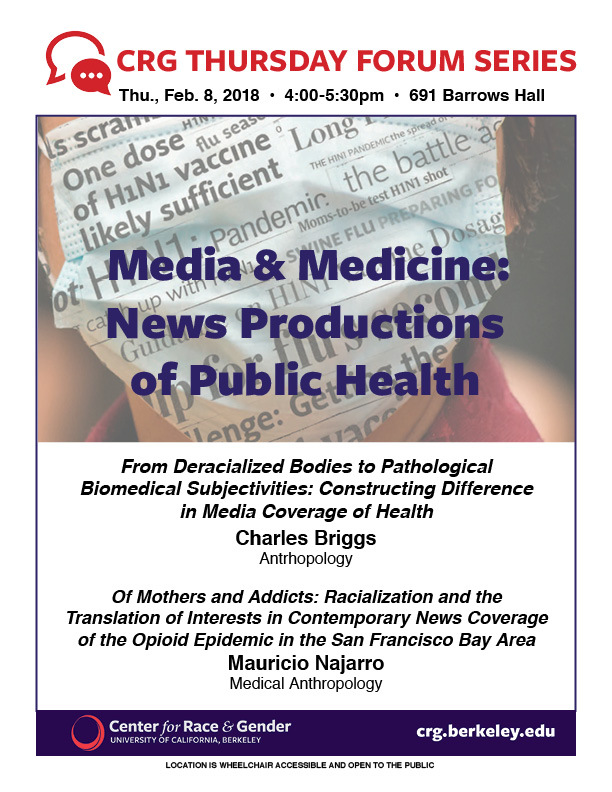 In this paper, I will analyze the journalistic conventions that shape how notions of interest (personal interest, conflict of interest) are depicted by journalists who frame medicalized subjects and objects in news stories. I will focus specifically on the role of parent-advocates in constructing a new figure of the racialized addict. Drawing upon the work of feminist scholars and critical race theorists on the relation between racialized motherhood, death, and representation as well as my own interviews with local journalists and lay people, I will focus on the co-production of a fragile and vulnerable whiteness prone to addiction and the collateral figures who remain in the shadows and margins of contemporary discourse and policy debates on addiction as a medical problem. Mauricio Najarro is a second year PhD student in the Joint UC Berkeley-UCSF Medical Anthropology program with a Designated Emphasis in Science & Technology Studies. He is also a PhD candidate in Religion at the Graduate Theological Union. His research is on the globalization and mediatization of the opioid epidemic both in the United States—specifically the San Francisco Bay Area—and northern India—specifically Punjab. He is interested in understanding how journalists, medical researchers, public health authorities, and lay people construct notions of the addict and the addicted body in news reporting and how such reporting shapes both beliefs and interventions about addiction, the addict, the chemical prosthetic.